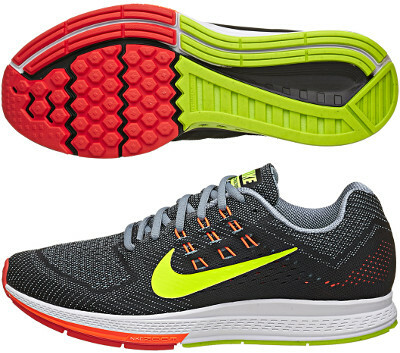 Nike Air Zoom Structure 18 are stability cushioned running shoes. The Nike Air Zoom Structure 18 is an everyday training model for runners with overpronation looking for a lot of cushioning. It is part of the Nike Running 2014 Spring/Summer Zoom Air collection. Main change for this version takes part in the motion control system designed to slow down the rate of pronation and promote natural movement of the foot: triple-density Dynamic Support technology in the midsole, Asymetrical Dynamic Flywire that wraps around the midfoot and a lateral crash rail in the outsole. Cushioning relays on co-molded dual-density foam in the midsole combined with decoupled Nike Zoom Air crash pads in the heel and forefoot providing a more responsive stride. Outsole has been redesigned to increase flexibility and the upper creates an adaptable fit with new seamless mesh. This model is available for customization under NIKEiD program.